“We do not what we ought,What we ought not, we do,And lean upon the thoughtThat Chance will bring us through.” Empedocles-about 430BC, who ought not to have thrown himself into the crater to prove that the gases would support his body weight. Chance was unkind. “A’ Muntagna” (“the mountain” in local dialect) has always dominated the lives of those who live in its shadow: Its lava flows and dust clouds bring destruction, but they also enrich the soil, making the lower slopes and the surrounding plains some of the most fertile regions in Sicily, and spawning vast expanses of vines and citrus plantation. The periodic eruptions have been well documented through history, from the tales of Pindar to the modern day. Recent eruptions have been spectacular in their nature, though quite safe as they start far from inhabited areas. 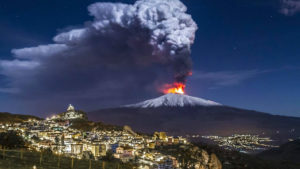 Whenever Etna erupts, journalists and travellers are drawn from all over the world to admire (from a safe distance) the unique sight of the smoking craters and snaking lava flows, which are visible from miles away. Hiking on Etna is a fabulous experience and you will get much more from it if you take advantage of the knowledge of one of our qualified guides. A cable car takes some of the sweat out of the trip up, and the descent past the awe inspiring Valle del Bove with its deep canyon of spent lava flows is an experience you won’t forget in a hurry. There are two main points of departure for a trip on Etna: Etna Sud (la Sapienza) from which you may either walk or take the cable car to 2,900m, from there it is a 2-4 hour round trip to the summit craters, although there is no need to go that far to get a good feel for the majesty of the mountain. The other point of departure is Etna Nord (Piano Provenzana) from where you may walk or take 4X4 buses up to the observatory at 2,400m. You may walk to the summit craters from there. We would strongly discourage you from venturing to the main craters of Etna without a qualified guide. Apart from the volcanic aspect, you must remember that this is a very high mountain and should be respected as such. The weather can change quickly, and it can get very cold even in the height of summer. If you are planning on doing anything more than stepping out of the cable car to look at the view, you should be properly equipped with good boots, long trousers, a couple of warm outer layers, hat, gloves and a waterproof jacket. Make sure you take some water and food too. Our recommended guide:Andrea Ercolani has lived and worked as a mountain guide in Switzerland and Sicily. He now lives in San Alfio on the flanks of Etna. He is a certified vulcanologist and a member of the Sicilian “College of Mountain Guides and Vulcanologists”, making him a fascinating travel companion as well as a safe pair of feet on the mountain. Call him on +39 348 8530310 if you would like to book a day or two with him. We recommend that you book in advance as he is often busy.